The diseased aorta, involving both the ascending and descending segments is technically challenging to treat due to the long duration of surgery, the need for circulatory arrest in the first step, surgical complications related to vital vascular and anatomical structures in close proximity, as well as a possible further period of circulatory arrest during the following necessary step(s). 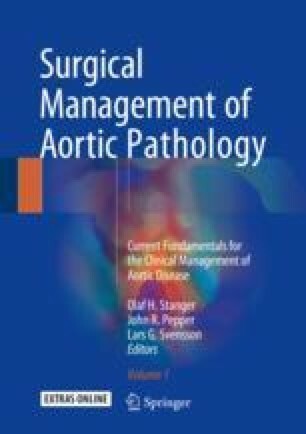 Introducing and establishing the conventional and frozen elephant trunk technique into clinical routine were evolutional steps in treating extensive and cross-border pathologies of the thoracic aorta. This chapter will review the historical evolution of the elephant trunk techniques, discuss indications and results, explain different techniques and its pitfalls, and give useful tips and bail-out performing such procedures. The authors would like to thank Dr. Alexander Curtis (Oxford University Hospitals NHS Foundation Trust, Oxford, United Kingdom) and Prof. Nawid Khaladj (University Medicine Rostock, Germany) for their productive and editorial advice and critical review of the manuscript. They also thank Rob Flewell, Anatomy by Design, Inc. (Figs. 69.2, 69.3, 69.4, and 69.5), and Daniela Martens (Fig. 69.1) for creating the technical illustrations and graphics and Dr. Maximilian Pichlmaier for the support to the series of figures.